Being in the middle of a state in Middle America is actually a pretty ideal situation for a music lover. Being at the convergence point for artists from all over the country is quite the advantage, and a festival like Columbia, Missouri’s Roots ‘N Blues ‘N BBQ Festival proves it, combining local and national performers. This year’s ‘fest faltered a bit from the previous two years (charging for entry for the first time and a last-minute cancelation from Dan Tyminski will do that), but there were still a few high points. 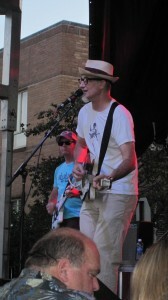 Chapel Hill, N.C.’s Southern Culture on the Skids were one of the highlights of Friday evening, doling out lightning-fast rockabilly riffs piled higher than bassist Mary Huff-Miller’s hair. 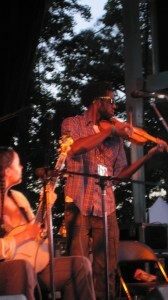 The Carolina Chocolate Drops, a trio rooted in the African-American banjo and fiddle tradition of North Carolina’s Piedmont area, had people stomping and clapping to rollicking tunes like “Starry Crown” and “Cornbread and Butterbeans.” When Dom Flemons began keeping time with the jug, an air of amused nostalgia overtook the crowd, the younger members of the audience delighted with the new sounds. Pinetop Perkins, the former pianist for Muddy Waters’s band, kept the delightfully swampy blues of the Mississippi Delta alive. 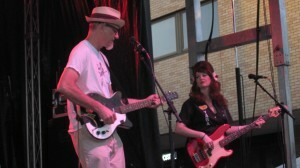 But the festival’s highest point was a super-funky band from Austin, Texas. The slick, genre-bending funk of Black Joe Lewis & The Honeybears, a group who previously made waves on the festival circuit with gigs at South By Southwest, Lollapalooza and other big-name ‘fests. Their set of boisterous, brassy R&B-infused funk, topped with Lewis’s smoky voice layering on as thick as BBQ sauce on a pulled-pork sandwich, gave way to an exuberant dance party in the middle of Seventh Street, where aging townies, hippies and college kids shook their groove things with mad ferocity. “Some people say we’ve got too many songs about booties,” Lewis joked. We contend there is no such thing, Joe. No such thing. Rain marred much of Saturday afternoon, but southern Cal country gal Heather Myles shone on stage, alluring the audience with her luminous drawl. The band paid tribute to one of country’s greats, Johnny Cash.